Everyone at some point will have incorporated aromatic herbs and spices into their homecooked meals – from herbs such as garlic, basil, chives and rosemary to spices - turmeric, coriander and cinnamon. These natural flavours simply make food taste better, so weaning your baby to slowly accept these flavours is a fantastic idea! It will certainly make transition onto family meals much smoother as your baby grows, since I’m guessing you already cook with some of these flavours in your everyday meals. In my experience, this was life-enhancing for my baby. Life-enhancing given that these unique flavours helped me offer my little one nourishing, delicious meals. These meals led to a love of wholesome home cooked food which have now set the foundation for healthy eating habits for years to come. 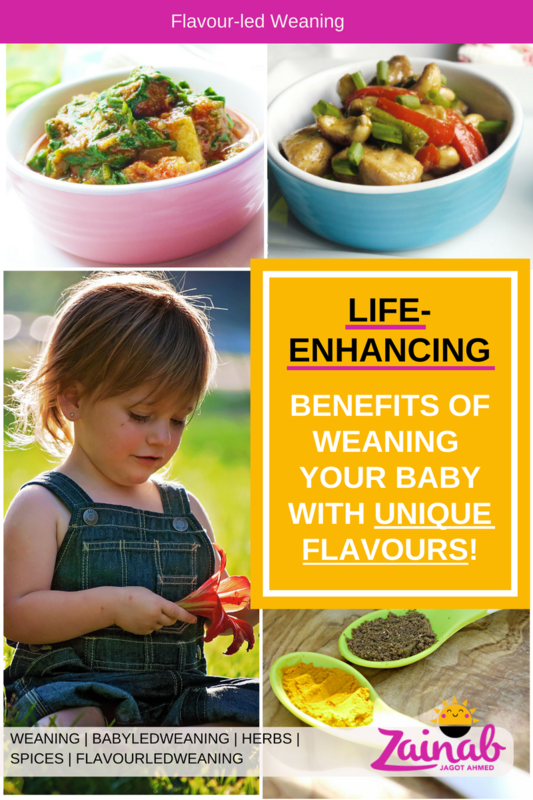 Flavour-led weaning ultimately helped me give my little girl the best start in life. Herbs and spices have a broad range and depth of flavours and can really enhance the taste of different foods. The more you nurture your little one’s taste buds by offering delicious flavours – bitter, sour, sweet and savoury – the more your baby’s taste buds will open and flourish! Thriving taste buds means a more diverse flavour palate. Read Add Flavour: 19 First Taste Herbs and Spices for Weaning Your Baby for more details on safe, unique baby-friendly flavours. 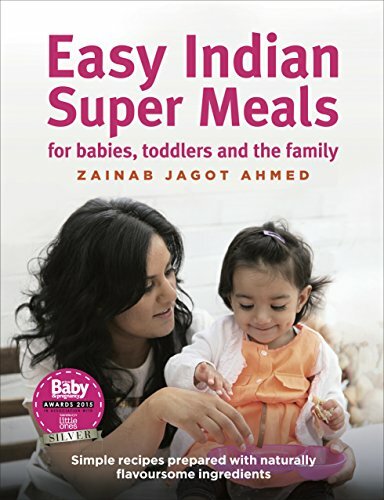 When I first began weaning my little one with aromatic Indian baby meals, I remember thinking “Wow! This smells amazing! I wouldn’t mind a cheeky mouthful of this myself”. The delicious aroma, when the herbs and spices were cooked, was simply mouth-watering. It was so good, I couldn’t wait to dig in to my daughter’s meal! And in my experience, it was no different for my little one – she couldn’t wait either! 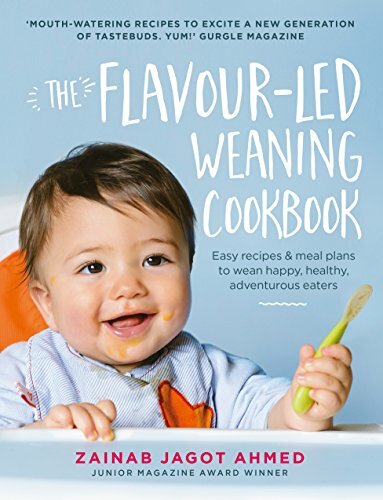 A wonderful alternative to adding salt and sugar into baby food, herbs and spices will help you create incredibly tasty meals that your little one will wholeheartedly enjoy. Before you know it, baby will be excited to try tasty new meals developing a positive relationship with food. Try some of my yummy recipes here, from stage 1 weaning recipes all the way through to family meals, and quick snacks for the school years. This really was the cherry on top of the cake for me. My little one ate everything! And still does! The thought of having a fussy eater filled me with dread - I wasn’t prepared to cook separate meals for family members. Weaning my little one with a diverse flavour palate was the best decision I made. Now she’s willing to try everything, and I attribute this to the range of flavours I offered her during our weaning journey. Give it a go… it can reduce the chance of fussy-eating behaviours emerging in your little one too. Before you begin, have a quick read of my One Week Feeding Plan for safe introduction. As your baby’s diet becomes more reliant on solid food it will be less challenging for you to help her achieve a well-balanced diet, if she is accepting of new foods. A broad and balanced diet is essential to make sure your baby is receiving all of the vitamins and minerals required for healthy growth. After all, a HEALTHY baby is a HAPPY baby! Read my MUST-KNOW details on achieving a balanced diet for baby here. Black Pepper - helps to settle indigestion, constipation, reduces pain in toothaches. Cardamom - prevents colds and flu (influenza), analgesic properties treat teeth and gums, throat infections, prevents flatulence, treats asthma and bronchitis. Cinnamon - analgesic properties to help reduce pain in toothaches, aids digestion, treats diarrhoea, strengthens the immune system to cure colds, boosts memory and cognitive function, balances blood sugar level (type 2 diabetes). Cloves - antiseptic properties help to fight against colds and flu, bronchitis and athlete’s foot. Treats flatulence and boosts digestion. Analgesic properties reduce pain in toothaches, boost memory and blood circulation. Coriander - aids digestion, treats diarrhoea, provides iron to help prevent anaemia, and protects skin against eczema and dryness. Cumin - supports the development of a healthy immune system, improves oxygen distribution, better digestion, boosts metabolism, and improves absorption of nutrients. Paprika - antibiotic properties help protect against bacterial infections such as tonsillitis, improves blood circulation and aids digestion. Turmeric - anti-bacterial properties help to prevent infection in wounds and cuts, aids digestion, reduces flatulence, boosts immune system function for cold and flu protection and reduced risk of developing childhood leukaemia. Take a peek at my Home Remedies for soothing recipes for baby.